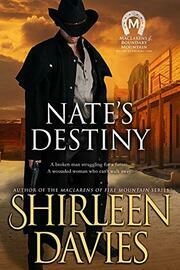 Nate Hollis had everything, until a Confederate cannonball changed the course of his life. His job as a deputy in Conviction and his love for a beautiful woman allows him to dream of a future he once thought lost. He never counted on the gnawing pain of his injury and the craving for relief to spiral him downward into a man he hardly recognizes. Geneen MacGregor feels blessed to be considered a part of the MacLaren family and a valued member of their ranch. Her love for Nate provides the dream of someday marrying and having a family of her own—until she wakes one morning to find him gone. To escape his persistent hunger for opium, Nate travels a few hours north to a small town along the Feather River. A job at the livery allows him to envision a new start where he’s free from the insidious drug and once again able to be the man Geneen deserves. The invitation to join her good friends at their ranch near Settlers Valley is what she needs to rid Nate from her mind. After months without word, Geneen is certain the man she loves with all her heart has forgotten her. Then an accidental encounter brings more anger than forgiveness, more questions than answers. A second chance seems as far away as ever with neither able to bridge the gap between them. Their efforts to mend the past stall as a series of dangerous events forces Nate to help an old friend, and a monster from the past poses a new threat to the people of Settlers Valley. Can two people, once so much in love, heal the wounds of the past to create a future brighter than either had ever imagined? Nate’s Destiny, book six in the MacLarens of Boundary Mountain Historical Western Romance Series, is a stand-alone, full-length novel with an HEA and no cliffhanger.